To prepare for climate change impacts, companies and countries around the world will have to build their climate resilience through adaptation, creating markets for adaptation goods and services. With partners at Deloitte, ESSA researched the potential size of the opportunity and requirements for Canadian firms as suppliers. Canada – national study with international implications. To prepare for changing climate conditions and related risks, companies and countries around the world will have to enhance their climate resilience through adaptation. 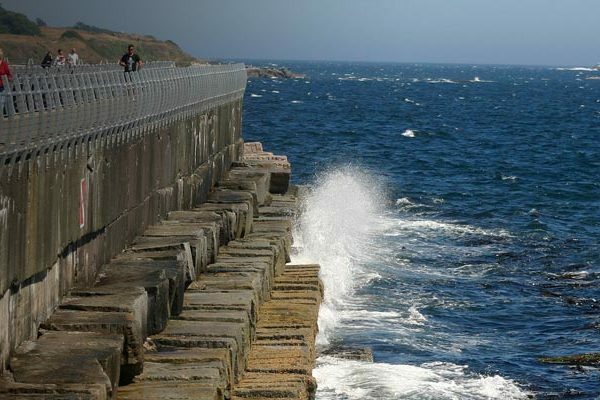 Adaptation—including through technological innovation, institutional strengthening, economic diversification, and infrastructure design—can help to reduce risks in the current climate, and to manage future risks in the face of climate change. As risk awareness increases and policies and regulations emerge, the demand for climate adaptation solutions will grow. This creates new business opportunities. Economies that invest in building climate resilience of their sectors and create the right conditions to grow adaptation markets domestically will be at an advantage in the race to supply solutions to fill critical needs globally. 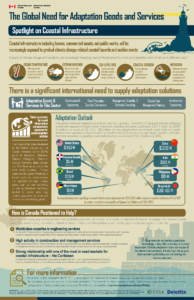 Commissioned by Natural Resources Canada, and in collaboration with partners at Deloitte, ESSA undertook scoping research to explore the prospects for Canadian firms to supply adaptation goods and services to international markets. 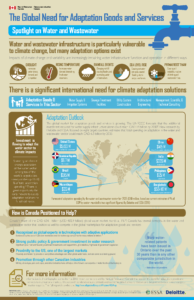 Adaptation goods and services include those driven by specific climate change risks, as well as those supporting climate resilience as an indirect or supplemental benefit. 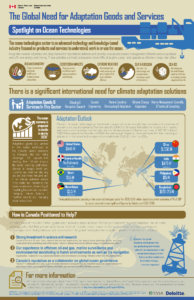 Although much information exists on the risks to Canadian regions and sectors from the impacts of climate change, information on potential economic opportunities stemming from adaptation planning and actions in Canada and internationally is scarce. The findings of this report begin to fill this knowledge gap. Summarized in a report and five infographics (see below), the research combined analysis of trade and economic data, literature reviews and the perspectives of sixteen subject-matter experts to assess the supply potential of four Canadian sectors (water and wastewater, coastal infrastructure, forestry & related products and services and ocean technologies) and potential demand from eight export markets into the 2030s. 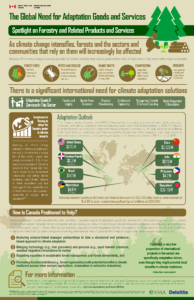 The report also includes recommendations to help position Canadian exporters of adaptation goods and services to fill existing and foreseeable adaptation needs around the world. Among other areas of action, we highlight the need to streamline the communication of opportunities best suited to Canadian strengths in adaptation, help develop a healthy ecosystem of agile and innovative companies and shift infrastructure procurement practices so that our “home grown” talent in infrastructure resilience and engineering can be showcased internationally. The key outcomes of this project have been summarized into four sector-specific infographics and one national overview infographic to facilitate communication of the results to decision-makers with limited time and to provide an easier entry-point to the work that will encourage engagement with the larger report. 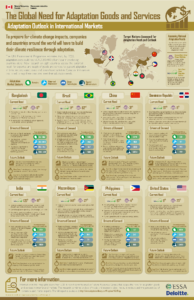 Click on each infographic to download the full-sized PDF.